This week’s photo challenge is “curves”. I’ve been waiting for an excuse to share some rainbow shots and thought this was the opportunity to do so! 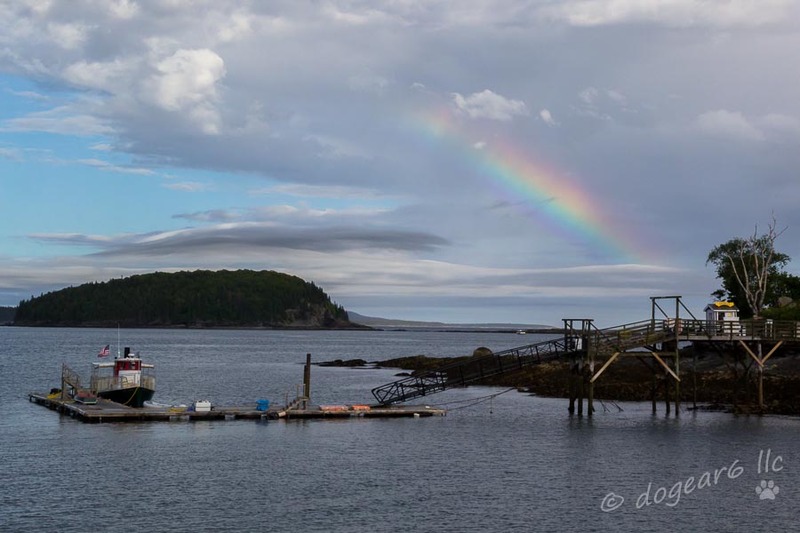 The above rainbow was taken last week from the pier in Bar Harbor, Maine. A rainbow’s colors are red, orange, yellow, green, blue, indigo and violet. And I can see them all too! The picture below is in the moments before the rainbow dissolved away. You might want to double click and blow it up so you can see it better – there are vertical lines up and down the rainbow as it fades away. I’ve never seen how a rainbow disappears, so when I edited the pictures and saw that, I loved it. Seeing a rainbow disappearing is really cool, but so is a double rainbow. I took the below pictures last year from the windows of my employer. According to Wikipedia, when a double rainbow occurs, it is always on the outside of the primary rainbow and its colors are reversed. I’m sure there’s a scientific explanation for it, but I was happy to click quickly enough with my iPhone to capture their fleeting beauty. The left rainbow was from the windows in front of my desk, which faces north. The right rainbow was taken around the corner, from windows that face east. As you can see, the rainbow was HUGE! It’s a bit harder to see the colors, although the east view on the right is better defined, probably because the sun was setting in the west when I took this. 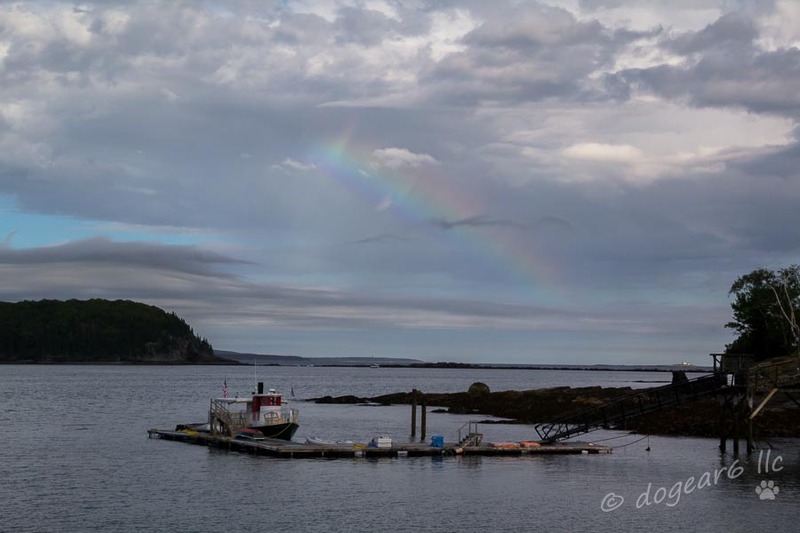 The rainbow at Bar Harbor was much shorter, but wider, so the colors are better seen. These are the only two times I was fast enough to capture a rainbow before it vanished. I’m happy to have gotten what I did and to be able to share their gracious curves in the sky. The Bible tells us that the rainbow was set in the heavens as a reminder that never again would the waters become a flood to destroy all life. Seeing them is a reminder to thank God for his promises – not just this one, but any promise that is working in your life at the moment. the music of the wind and the silence of the stars? Anyone who has loved has been touched by magic. Often the hardest part about catching the rainbow is not having a camera when you happen to run into one! This are so beautiful, Nancy. I too did not know about the reversed color spectrum in a double rainbow. Now I will be going to find out “WHY”. Not having the camera on me is exactly why I don’t have more rainbow pictures, although we don’t see many here in Virginia. I’m sure the color reversing has to do with how it refracts – it’s mirroring the original rainbow. According to Wikipedia, “This second rainbow is caused by light reflecting twice inside water droplets.” Wouldn’t ya’ think a droplet is too small to have a double reflection in it?? As the firefighters fought our church building fire someone took a picture of a rainbow in the midst of the water. What a powerful reminder they are of God’s faithfulness. Nice pictures, as usual. Thanks for the compliment. You’re right about the rainbows showing when least expected and most needed. Thanks Lyliana! And yes, I did see which one you were in your photo. The one with the really big smile on her face. I didn’t know about the reverse colors on a double rainbow. I want to see one again so I can pay attention. I’m usually so busy shooting away that I fail to notice the details. Thanks for pointing out the disappearing act, I would have missed it. I didn’t know that about the reverse colors until I read it in Wikipedia. If you blow up my picture with the double rainbow, you can see it’s true. Wasn’t that disappearance incredible? I was just shooting away and didn’t realize what was going on until I looked at it later. What a superb rainbow collection. I’ve never been able to shoot one. Well done. Thanks for the compliment! A big part of it is just being there and being alert to it. I nearly missed the one at work because my head was down and I was working. One of my co-workers looked up and saw it and went “oh!” which made the rest of us look. Absolutely beautiful rainbows! Thanks so much for sharing! Thank you – I’m glad you enjoyed them! Beautiful images and beautiful sentiments. Thank you for sharing. HOW LUCKY FOR YOU TO GET SUCH GREAT PICTURES OF RAINBOWS. THEY ARE SO FLEETING. THANKS FOR SHARING THEM. Beautiful. We once drove through the pot of gold at the end of the rainbow as it ended on the earth. It was INCREDIBLE!!!! We were all tinty green. I love the shots next to each other to show the entire rainbow. Great shots! That’s an incredible story! My Mom saw your comment and was surprised that the light was tinted. I’m glad you liked the shots juxtapositioned. That’s what I was trying for. Love the rainbow shots!! They are not easy to capture. Thanks Darlene. I really had trouble getting it to focus since there’s not really anything there for the camera to lock onto.